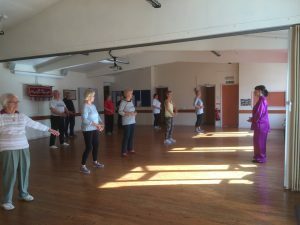 Members of our WI are welcome to join a very successful T‘ai Chi group that meets in Hythe. The group meets every Thursday morning from 9.00 to 10.00 am which can be extended until 10.30 am for those wishing to do so. The class takes place in the Burton Hall in Albert Lane which is off Stade Street. Each session costs £5 and is run by the lovely tutor Anna. T‘ai Chi involves stretching every part of your body and is suitable for every age group and ability. It does not involve floor and balancing exercises. Anna really puts you at your ease and you simply do as much or as little as you want to do. At the end of each session you feel so much better! Come and give it a try ! For more information speak to Jackie Vickerman at a monthly meeting or use the contact page on this website.